It was a bit windy and rainy this past week but despite the weather we got out there and got into some fish! As per my past reports, there isn’t one particular spot that is out producing, it has been more about where you can hide from the wind. Then you need to put in your time, and as usual you will be rewarded with your fair share of opportunities. Speaking of the wind and rain, it looks like this weekend we are going to get a break from that and the long term forecast looks pretty good as well with sunny days ahead. This might give you the opportunity to head over to the Gulf Islands in search of winter chinook, which is usually a pretty good bet this time of year. With the forecast the way it is, pretty much all the major spots will be fishable this weekend. A couple of nice chinook taken on Lemon Lime flasher with 3.0 G-Force BC spoon and Purple Phantom Flasher with 3.0 Kingfisher Herring Aide spoon. The water has gotten clear and stayed clear for the most part so the black and purple flashers are starting to come into their own. 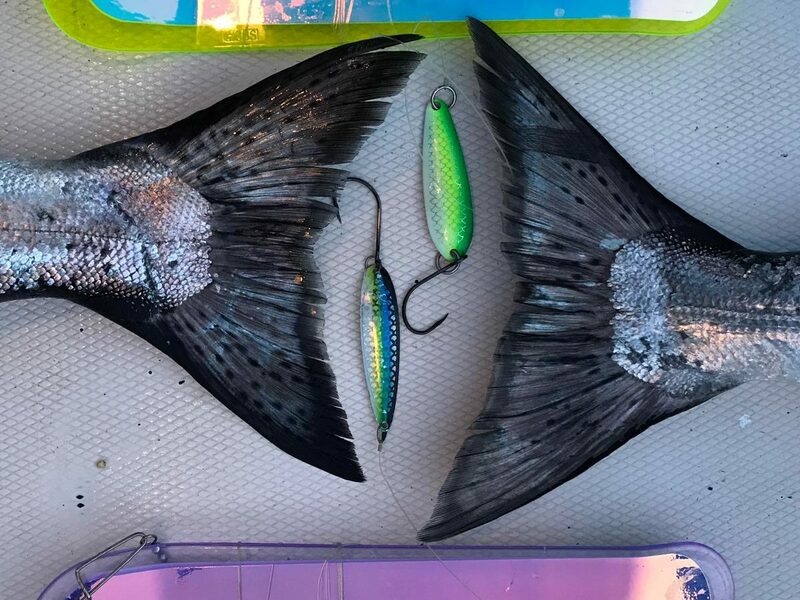 The PA Custom 50/50, Glow/Moon Jelly in the black blade or UV purple blade has been working well when paired up with Herring Aide spoons and Cookies n’ Cream spoons. The green and chartreuse gear is still producing, such as Lemon Lime flashers and Irish Creams or Outfitters, but the “darker” colour gear is starting to out fish it on some days. Some days its all about just finding the bait and the fish, but when you are having days with lots of bites from both legal and undersize fish, you can definitely see a pattern when it comes to which the colours the fish are preferring. A nice chinook from a trip this Thursday and some prawns for dinner as well! Prawning continues to be solid, while crabbing continues to be slow, so we are dropping prawn traps on our 8-hour trips. If you would like to book a trip, give us a call at 778-788-8582 and get out there and enjoy some fresh air, winter chinook, and BC spot prawns!